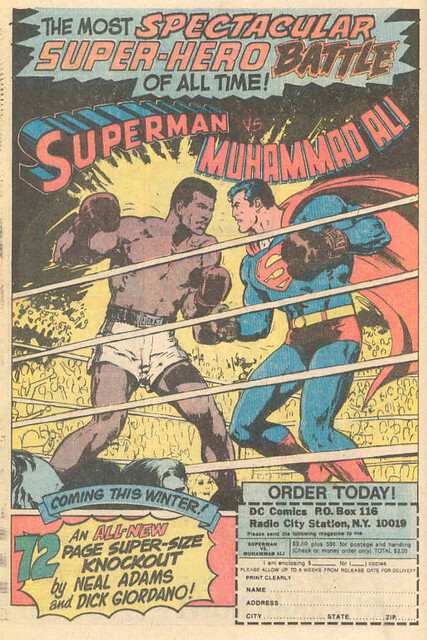 In 1978, DC Comics published an over-sized 72-page special edition entitled Superman vs. Muhammad Ali, in which the Man of Steel and The Greatest team to stave off an alien invasion. 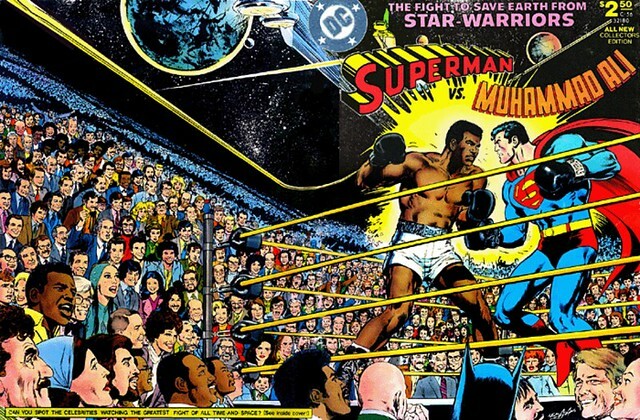 The issue’s wraparound cover shows a host of late 1970s celebrities, including Frank Sinatra, Lucille Ball, Tony Orlando, Johnny Carson, the cast of Welcome Back Kotter, and The Jackson 5–seated amongst Wonder Woman, Batman, Green Lantern, and other DC superheroes, as well as Warner and DC employees. The original draft included Mick Jagger in the lower left corner; he was replaced by promoter Don King. See a list of those depicted here. * Muhammad Ali, nee Cassius Marcellus Clay Jr.
As we float like butterflies, we might recall that is was on this date in 1948 that Joe Louis, “The Brown Bomber,” successfully defended his Heavyweight Championship against Jersey Joe Walcott. The bout between two African-American athletes was a victory over the prejudices of the time. 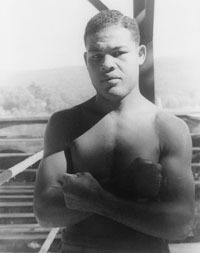 Louis held his title for three more years before retiring; in all, Louis successfully defended his Heavyweight title 25 times from 1937 to 1948, and was a world champion for 11 years and 10 months. Both are still records in the heavyweight division, the former in any division. 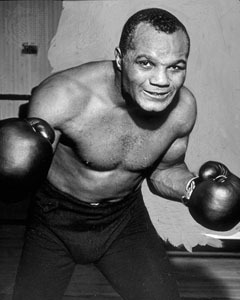 Walcott went on to defeat Ezzard Charles for the title on 1951, at age 37, becoming the oldest person to wear the Champion’s belt (until George Foreman won it at 45). With Jesse Owens and Jackie Robinson, Louis is widely regarded as one of the first African American “national heroes” in the United States, and was a focal point of anti-Nazi sentiment leading up to and during World War II. He was instrumental in integrating the game of golf, breaking the sport’s color barrier in America by appearing under a sponsor’s exemption in a PGA event in 1952. Walcott went on to Hollywood (he starred with Humphrey Bogart in The Harder they Fall), then into politics– he was elected sheriff of Camden County, New Jersey in 1971– the first African-American to hold the post.